Sony Xperia Z5 Premium review | What Hi-Fi? In a world that’s only just making any useful sense of 4K on TV screens, the idea of having the technology on a mobile phone might seem, at best, superfluous, and at worst pointless. However, with 2K phone screens now on the verge of their third generation, it was only a matter of time before a manufacturer took the ‘world’s first 4K smartphone’ title and ran with it, and Sony has beaten the competition. An impressive headline for sure, but the Xperia Z5 Premium doesn’t quite follow through with its 4K promises. While the display is indeed a 4K screen (UHD if we’re being picky), most of the time you won’t actually be watching 4K, making the phone’s killer feature a bit of a damp squib. That’s not to say it isn’t impressive. The 5.5in IPS display does boast a 3840 x 2160 pixel resolution with an amazing 806ppi – almost double that of the standard Xperia Z5. The problem is that the operating system hasn’t been optimised in 4K, nor have the majority of apps, so with the exception of Sony’s own Video and Photos applications, most of the time you’ll be seeing things only in full HD. The Xperia Z5 Premium is capable of capturing 4K video, so you can watch that back natively, but 4K content from the likes of YouTube, Netflix and Amazon isn’t yet compatible with mobile, leaving you a little short. We load some 4K demo clips on to the phone, and it looks stunning. Contrast is strong, with deep blacks and clean bright whites, though there is a slight loss of shadow detail compared with the likes of the iPhone 6S, which keeps the outlines of objects clearer in murkier scenes. Colours are punchier but also on the cooler side when compared with the iPhone too, with reds and greens in particular standing out, but not unnaturally so. There’s still subtlety here, it’s not just about in-your-face colour. It makes for a very engaging picture, offering a real sense of depth and all the detail you’d expect at this resolution, giving a real glimpse of what movies on-the-go could look like once all the technology is ready to support it. It’s not the brightest screen though, so you will find yourself wanting to notch up the brightness to near maximum, which affects the battery life. At half brightness (where we run our battery run down test), the picture looks considerably duller than the iPhone 6S, and even the Xperia Z5 out-brightens its bigger brother. Step down to Full HD and despite Sony’s claims of upscaling, we couldn’t see too much by way of obvious improvements when comparing the Z5 Premium to the iPhone 6S and the regular Xperia Z5. We don’t feel disappointed for too long, as it’s still a great picture, matching its competition pretty closely in terms of detail levels and insight, and carrying off the same bright colour palette as before, whether we choose content stored on the phone or stream from Netflix. We’d steer clear of the Image Enhancement options in most situations though – the Super Vivid oversaturates colours by some margin (but could be useful for watching video in direct sunshine), while the X Reality Pro often oversharpens edges, so we prefer it off for the most natural picture. As always, it’s worth playing with the settings to see what suits. The Z5 Premium follows in the footsteps of the rest of the Z5 family, dropping the much-lauded rounder edges of the Z3 for a flatter, boxier design that hails back to the early Z range days. Far from being a nostalgic hat tip though, this design is to accommodate the new fingerprint scanner power button on the right hand edge. Sony is particularly proud of its fingerprint scanner because of its size – it’s much slimmer than those on the likes of the Samsung Galaxy S6 or the iPhone 6S. On the whole, we found it to be reliable, even when trying to catch it out. It’s quick too, allowing you to both wake the phone and unlock it in under a second. However, the fingerprint scanner has caused the volume rocker to be moved to the bottom half of the phone – a bit of a logistical issue when using the phone in portrait mode. Elsewhere, the design is pretty familiar, with Gorilla Glass back and front panels (which are still fond of harbouring fingerprints), aluminium trim and nylon corners to protect it from knocks. The boxy design has left a notable edge to the front and back of the frame, which doesn’t feel the most ‘premium’, but at 7.8mm thin, the phone is slim enough to look the part (if a touch on the heavier side at 180g). Its skinny left- and right-hand bezels mean it doesn't feel like a large device in the hand either. Finally, as you’d expect with Sony, the Z5 Premium is waterproof as standard, with the same uncovered waterproof micro-USB charging port as was first seen on the Z4 Tablet. 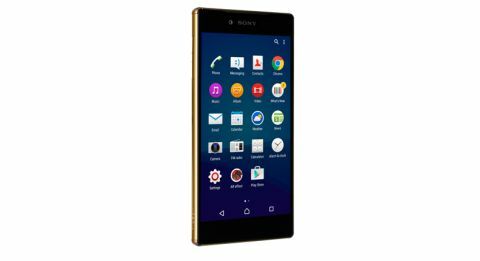 Getting down to the nitty gritty, the Sony Xperia Z5 Premium packs a 64-bit octa-core Snapdragon 810 processor, with 3GB RAM. It’s the same processor that plagued the Z3+ with overheating issues, but we don’t notice anything more than slight warming when shooting 4K video and playing games for an extended period. There's only a single choice of 32GB of on-board memory, but with a microSD card slot supporting cards of up to 200GB, we don't think this will be an issue for most people. Sony has toned down its user interface, which sits over the top of Android Lollipop, with simpler icons and an overall stripped back approach. There are still more Sony apps than necessary, particularly Sony’s own versions of apps that Google does better. Despite the 4K screen, Sony has managed to keep the battery life on the Z5 Premium under control. That’s largely because you won’t be using it to its full potential most of the time. We’re not totally convinced by Sony’s two-day battery-life claim, but we get through around a full day of normal usage. As ever, you will find it drain quicker if you’ve got a long commute filled with video or gaming. It also takes a hit if you are tempted to have the brightness up high when watching movies. Sony has followed in the footsteps of its other devices in the sound stakes and kept high-resolution audio support on the Z5 Premium. The sound is well-timed and full of detail, but with the same refinement we noted on the Xperia Z5. Music sounds clean, with a focused and enthusiastic midrange and a rich, weighty low end. Listen to a hi-res recording of Muse’s Supremacy and rhythms stay tight as the song rises and falls in tempo. Drum kicks are full-bodied and authoritative and there’s plenty of space afforded to the grandiose instrumental arrangement. An acoustic version of Gotye’s Somebody That I Used To Know shows the Z5 Premium its just as at home with quieter tracks. There’s superb insight and a great handle on dynamics that shows off the subtle differences in guitar strums. Sony has gone big on its camera for the Z5 family, and the same one features across the whole range. It’s the first time since the Xperia Z1 that the camera module has been redesigned from the ground up, and so Sony has been shouting loudly about it. The main camera is a 23MP snapper with an F2.0 lens and new larger 1/2.3 sensor. It uses a new hybrid autofocus that claims to take snaps in around 0.03 seconds. This might be true in perfect light conditions, but we find that any sort of variable light slows it down, and in low light it can be quite sluggish. The photos from the Z5 Premium are largely very good. In decent light, images look sharp, detailed and well balanced, with the Superior Auto+ mode doing a good job at choosing the best settings for the scenario. Colours are a touch more vibrant compared with the more natural iPhone 6s, and whites a little more bluey, but for the most part, the image stays on the right side of believable. Low light performance isn’t as good as we’d hoped though, and you’ll get cleaner results by using the flash. As for video, 4K comes into its own here, largely due to the fact you can watch it back in its native resolution. Whether 4K or full HD, videos are sharp and motion is smooth, with Sony’s SteadyShot feature on hand to help stabilise any shaky video to good effect. Shooting with 4K will bring on a bit of warmth to the handset – we were surprised at just how quickly the phone started to heat up – but this is a problem across all phones capable of shooting 4K, Keep it to short, snappy clips and you should be fine. The world’s first 4K smartphone doesn’t quite deliver in the way we’d hoped, that doesn’t mean it’s not a great phone. Once 4K content for mobile arrives, this sort of device will make much more sense. Right now, with its USP largely underused, this is basically a slightly bigger, fancier Xperia Z5 with a few tricks up its sleeve. The screen is gorgeous, but then so is the Z5’s – and a lot of the time, you won’t be able to see much difference, which makes the £200 price disparity a sticking point. There’s no doubt this is a capable phone with plenty of things to love – its snappy performance, great sound quality and quality build to name a few – but it has big competition, and not least from its cheaper, smaller and almost equally capable little brother.